Little hearts set with diamonds decorate the tops of these vintage platinum earrings. 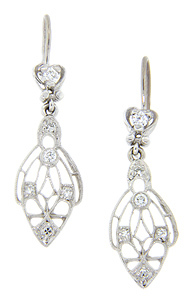 The dangling lower portion of the earrings features a beautiful filigree design that holds additional diamonds. The earrings have wire backs and measure 1 1/2" in height by 3/8” in width. Circa: 1930.